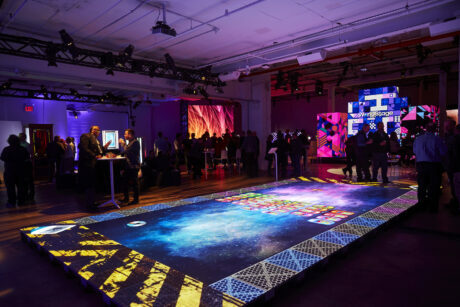 NYC – As 2018 came to a close WorldStage continued its annual tradition of presenting innovative demos on both coasts focusing on What’s NEXT in Technology. Clients, partners and industry veterans attended the NEXT demos held at The Garage in New York city and Dogpatch Studios in San Francisco. 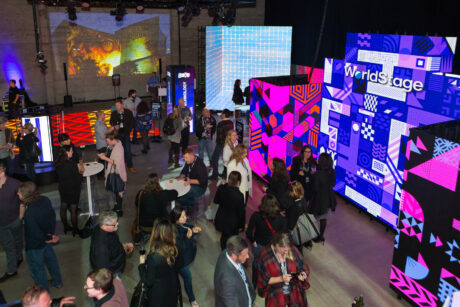 Each event featured two days of VIP guided tours showcasing a diverse selection of hi-tech solutions for the live event industry. 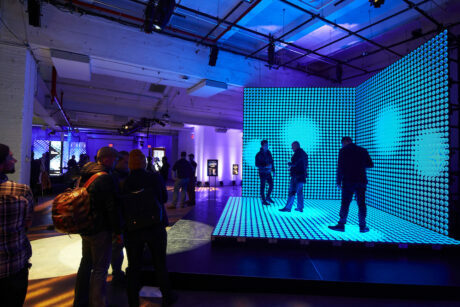 Highlights included examples of advanced interactivity, a new generation of video projection tools, creative design options for LED displays and four brand new, never-before-seen technologies. WorldStage’s Design & Development Department has a reputation for being at the forefront of technology and developing custom products and solutions. Some of the demos employed WorldStage’s new Waltz flexible show control platform, which bridges technologies used in creating interactive video content. 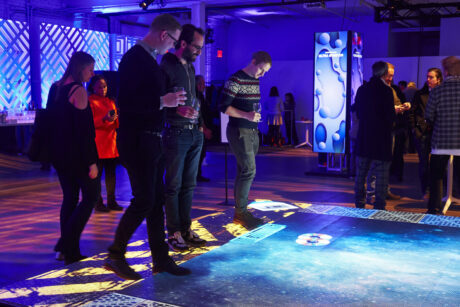 This proprietary software helped to transform WorldStage’s i5FLOOR interactive LED tiles with multitouch technology into two versions of the classic Brick Out game as well as a Saturday Night Fever-style dance floor. 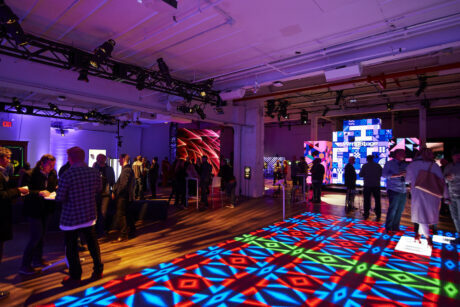 In another installation the combination of the i5FLOOR and two right-angle ROE CB5 LED walls enabled users to choose from nine immersive experiences, complete with interactivity and dynamic content that moved seamlessly between the floor and walls. Waltz played a key role with Notch enabling the creation of interactive and video content in one unified real-time environment. An additional all right-angle LED design dubbed “The Castle” was achieved with WorldStage’s c3ONE custom-designed LED tiles, Brompton processing and custom lightweight framing. 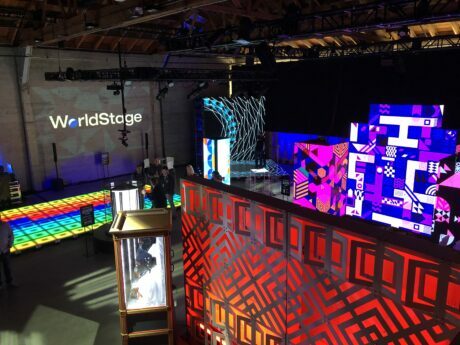 Rounding out the LED demos were WorldStage’s new high-resolution Sapphire panel display, ideal for small spaces and broadcast applications, which will be released in Q1 2019; a side-by-side LED comparison featuring c3ONE and Unilumin 2.6mm LED tiles; and a sneak peek at a large format LED video platform that promises lightning fast installation – available in Spring 2019. Some additional display technologies were real attention-grabbers. “Since everyone wants a photo booth, we added a camera gag to our WhiteSpace Zoetrope demo,” says Sabel. WhiteSpace display technology revealed content through a spinning wheel polarizer and used live video camera interaction to photograph the guest enhanced by selected Notch visual effects. “Your Creative Future” updated the popular Zoltar fortune-telling machine with WorldStage’s custom Blackbird see-through 55-inch display and touch interactivity. And A bright and dynamic “Monitor Tower,” composed of LG 88-inch UHD monitors, featured signage and changing content in a stunning vertical column. More technology firsts comprised the remaining demos. New trends in video projection featured Epson ultra-short-throw projectors, Robe’s RoboSpot follow spot system highlighted new control features in lighting, and WorldStage showcased a second-generation version of the popular SX3 self-contained show system for breakout rooms. Finally, WorldStage’s new, one-of-a-kind teleprompter solution, appropriately named eyesonly, was unveiled. It delivers added flexibility and confidence by allowing presenters to maintain direct eye contact with their audience while keeping the text of the message private. “This product was developed completely in-house by WorldStage and is the direct result of a client request,” says Sabel.